The drive from where I live to Kfar Kama, a neighboring village in Galilee, takes all but 10 minutes. But once you arrive it’s as if you’d stepped into an unknown world. Kfar Kama is home to 3000 Circassians, originally from the eastern shores of the Black Sea. At first glance, the place appears similar to Arab villages like Shibli or Daburiyya; there’s a mosque and a towering minaret in the distance, and women are covered in head scarves. But this is where the similarities end. 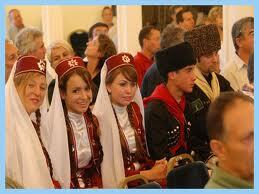 The Circassians are not Arab; many are fair-skinned, light-brown or blond hair, blue-eyed. Incidentally, up until 8000 years ago, all humans had brown eyes. Then a mutation occurred and blue-eyed people appeared. Where, you ask? Bingo! On the shores of the Black Sea region, and from there the blue-eyed people spread to Northern Europe, to Scandinavia. So, Anderson and Annika while you drive your Volvo in Stockholm, remember that you owe your good looks to the Circassians. The Circassians arrived in Galilee 150 years ago during the days of the Ottoman Empire when the Turks ruled the place. They didn’t come here voluntarily. The Russians in their 100-year-war against the Turks pushed out the Circassians from key trade routes at the border of Asia and Europe. They became country-less. Over a million died at the hands of the Russians. The Turks took them in with conditions: Convert from Christianity to Islam and fight the Russians. As expert horsemen and swordsmen they killed Russians. In fact their name,”Circassian,” means “decapitate or chop off soldiers,” in Turkish. Try walking around with that name for a while. Today the only thing the Circassians chop off is their famous cheese, similar to buffalo mozzarella. They farm their fields, raise cows and trade horses. 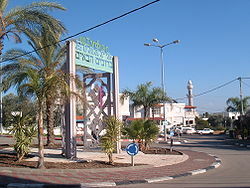 And they provide every imaginable service to the surrounding villages, including Kfar Tavor. The grocery store is open on Saturday (Shabbat) so it’s not uncommon to see Israeli Jews stocking up on bread, pitas, cheeses, produce. Kfar Kama is where I go to fix a TV screen, buy building supplies, get seasonal plants from the nursery, fix a flat tire for $8, or buy school uniform shirts for my daughters. The Circassians speak funny. Their cyrillic alphabet has 64 letters and it seems every word they say uses all letters. They’re a matter-of-fact bunch of people. I’ve gone to their village many times, and many times I smiled at them, thinking my smile may prompt a smile in return. It didn’t. It seems they left their facial smile muscles in the Black Sea. They’re courteous, all of them, hard-working, clean and tidy to the extreme, yet I can’t recall seeing their teeth. I don’t think Colgate is going to call them anytime soon. Their survival instinct has taught them to side with the strong. They did so with the Turks, now with the Israelis. Unlike the Arabs, they serve in the Israeli military. Their loyalty is without question. Even in Jordan, the Circassian foot soldiers watch over the life of King Abdullah. Apparently all this fascination with security has entered the Circassian bedroom as well. The man doesn’t date the girl much. Instead, he kidnaps her. According to their tradition, the man enters the girl’s house in the dead of night, wraps her in sheets and off they ride on horseback. He shoots 3 times in the air. The girl’s family and villagers give chase. If the man succeeds in making it beyond the village, he can claim the girl. If he fails, he’s punished, has to pay a fine, and his marriage is postponed. In other words, grow up kid, come back as a man. And don’t send wedding invitations ahead of time. There’s a 21st century twist to this tradition. The roads are asphalt paved so it’s hard on the horses. These days the lovers make their getaway on a motorcycle. And there’s no shooting bullets. Remember, this is the Middle East. Try writing material for this sitcom! There are only 4000 Circassians in all of Israel (5 million worldwide), so the pool of available men and women is limited. Matchmaking is forbidden, so is family inbreeding. This leads to a shallow waters from which to catch mermaids. Now that there’s peace with Jordan, some men go to Amman looking for a bride, some travel to Caucasus, to their ancestral homeland, and never return. I’m at the grocery store in Kfar Kama, pulling out stuff from the shopping cart. The help around me talk Circassian, all gibberish. I hand the woman cashier my credit card. She rings me up. I smile. Who knows, my charm might work one day. Fascinating stuff, Maurice. Blue eyes…I got ’em! Makes me want to do some research. But i have seen palestinians the lightest in that region i am sorry but i am not a middle eastern but what i have seen is that palestinians are lighter mediteranean and alot taller,cheers this is just what i have observed in the holy land peace. Not entirely accurate – The significant majority of chircassians were already Muslim – not converted by ottomans (please provide a source if your believe otherwise.) They resisted Russian occupation of their homeland under the leadership of Imam Shamil and Haci Murat who united the tribes of the causus to fight Russian invaders. The loss of life was devastating with the Russian ‘scorched earth campaign’ / ethnic cleansing.